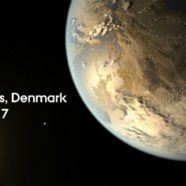 The European Astrobiology Network Association 2017 (EANA17) conference will take place 14-17 August, 2017 in Aarhus, Denmark. Among the many interesting and relevant topics for astrobiology, EANA17 emphasizes “Exoplanets”, a new and exciting field in the search for extraterrestrial life. The registration and abstract submission deadline is 1st June 2017: Registration link. Prior this, on the 12th and 13th August AbGradE will host a social event and a one-day workshop for young researchers in AbGradE. The registration deadline for AbGradE is 30th June 2017.